MEAT WE’RE PROUD TO PUT OUR NO NAME® ON. It all started in a Minnesota butcher shop in 1970. The neighborhood butchers spent many long hours envisioning, trimming and crafting the perfect hand-cut steak. Word quickly got around that those steaks cooked up tender and juicy. From then on, the No Name® steaks legend was in the books and meat lovers from near and far lined up outside the door and around the block to get their hands on those No Name® steaks. Today, the same No Name® magic is stronger than ever with a variety of hand-cut, butcher-quality steaks, premium fish, Steak Burgers and even bacon. Whatever we do, you can be sure it’s something special. Our butchers don’t stop working until it’s worthy of our No Name®. 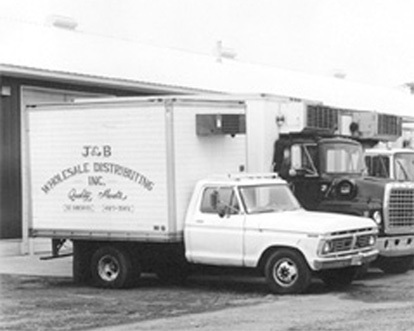 No Name® premium meat and fish is part of J&B Group, a family-owned business based in St. Michael, Minnesota. When J&B CEO, Mike Hageman, was in his sales days, he visited a small, neighborhood butcher shop that was one of J&B’s top beef customers. The rumors were true — people really were lined up outside the store waiting for No Name® steaks. Mike loved the steaks so much he made them part of the J&B family.